Screenshot of the Yellow Nineties Online. A couple of years ago, Connie introduced us to The Yellow Nineties Online, a project edited by Lorraine Janzen Kooistra and Dennis Denisoff at Ryerson University dedicated to producing a TEI-edition of late Victorian periodicals including not only the Yellow Book but also periodicals like the Evergreen and the Pagan Review. Since that post, I’ve used The Yellow Nineties Online in two of my courses this past winter term (we don’t even pretend to call it a spring term here in Calgary! ), and I thought it would be a good follow-up to blog about my experiences in the classroom here. 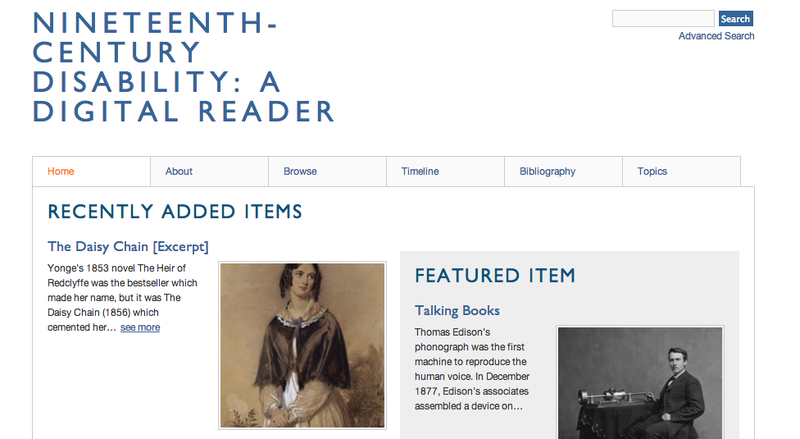 Following up on Connie’s post on “Editorial Traces: The Yellow Nineties Online“, I’d like to take this post to introduce another digital project, Nineteenth-Century Disability: A Digital Reader. The project is an interdisciplinary, open-access scholarly resource on physical and cognitive disability in the long nineteenth-century. Leading and emerging scholars in nineteenth-century disability studies (including the Floating Academy’s own Jennifer Esmail and Daniel Martin), have chosen texts and objects important to the field, and annotated them with introductions, footnotes, and suggestions for further reading. In her obituary for Dinah Mulock Craik, Margaret Oliphant wrote how pleased the author had been to learn that American tourists were flocking to Tewkesbury, a medieval market town in Gloucestershire, “not so much to see the town and abbey, as to identify the scenery of John Halifax”. * As postcards commemorating the sites of the novel attest, this literary tourism continued well into the twentieth century. As late as 1977, Dorothy Eagle pointed tourists to the haunts and homes of the Author of John Halifax in The Oxford Literary Guide to the British Isles.